Video Recipe - The easiest way to make mayonnaise is with a blender. But a hand whipped mayo is almost as easy, and it's a good technique to know. 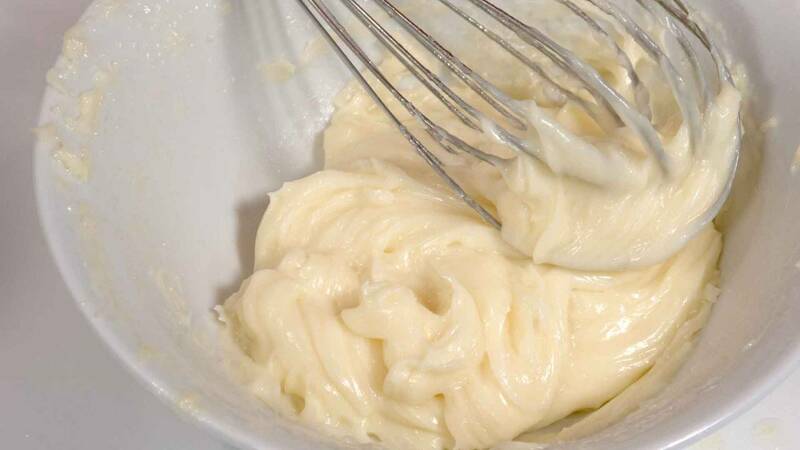 It is also easy to use hand-whipping technique in a stand mixer, and that is actually just as easy as blender mayonnaise. For large portions, it is actually easier. I also show how to save his mayonnaise if it becomes separated. Put the egg yolk and salt into a bowl. Add a little oil and mix to a uniform creaminess. Stir well with a whisk until it starts to become viscous. Add the oil only at one side, in a slow stream. Whisk from the oppsite side with the egg yolk in it, and then move slowly against the side where you add the oil. Add the oil in small portions at a time. When the mayonnaise thickens and become uniform in consistency, then add the lemon juice. Continue to add more oil until you have the amout of mayo that you need. If it becomes too thick you can just add more lemon juice, water or egg white. The ingredients should ideally have the same temperature. Then there is less likelihood of them separating. If the mayonnaise is runny, thin and grainy, then it is a sign that it should be restarted/rescued as described below. If it is very thick and seems seperated it is because there is too little fluid. Add more lemon. If you think it is too acidic, just add water or egg white. Mayo separates typically if there is too much liquid added in the beginning or the oil is poured too quickly. It is especially in the beginning that it happens. It is mechanically much easier in a mixer, but the principles are exactly the same. You can easily multiply the quantities up to 3 time for a large portion with one liter of oil, for example if you are expecting guests. You still only need 1 egg yolk. A 50/50 mixture of 10% drained yogurt and mayonnaise is good as a base for dressings or cold sauces, or as a slightly less fatty version of mayonnaise. I use this I almost exclusively in cold potato salads with a bit more more mustard, fish sauce and herbs. It is also good as a dipping or french fries sauce with spices and herbs. Add an egg yolk to a clean bowl. Pour a little of the separated mayonnaise in the egg yolk and stir until it gathers into a cream. Stir and pour the separated mayo in, in small portions. Wait to pour a new batch in until the previous one has collected again.